At the request of and in collaboration with the Mechatronics (MCTR) department at the Catholic University of Leuven (Belgium) SENSY has developed a custom-made force sensor. It is designed for a special interactive medical robot. This medical device is an external skeleton (exoskeleton) that supports the rehabilitation of the joint complex in the shoulder of patients who are suffering from paralysis after a stroke (CVA or cerebrovasculair accident). 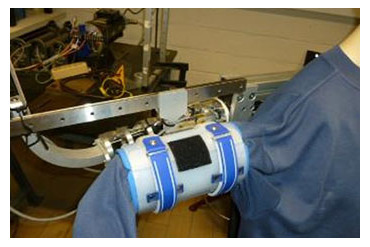 This bi-directional force sensor measures the forces induced when the patient moves his or her arm such as raising or lowering it, or moves his/her shoulder forwards or backwards. The medical robot (mounted on a kind of bag) assists the patient’s movements. The sensor measures the interaction forces applied by the robot to the patient and vice versa. The optimized version of the first prototype device will be operational in March 2013 and it will also be equipped with the same custom-made SENSY sensor.